Harrods is situated in the London boroughs of Kensington and Chelsea and is a high end store on Brompton Road. The store is of very impressive dimensions and there are more than 330 different departments within that cover more than one million square feet of floor. Several of the departments within the store are world famous. 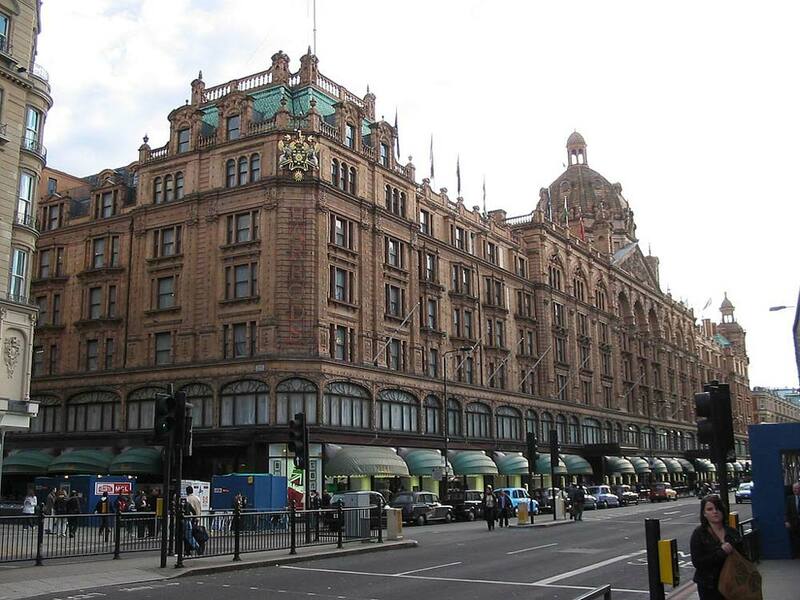 Harrods was founded by Charles Henry Harrod back in 1824 when he was just 25 years old. The original location was in Southwalk, where the business was a haberdashery, drapery and merchant. He ran the business here until 1831, and in 1832 he opened the first Harrods grocer in Clerkenwell. Then in 1834 he opened a grocer in the east end of London where he specialized in wholesale and particularly in tea. Then in 1849 Harrod took over a shop in Brompton, on the site where the store stands today. The business started off with two employees, but by 1880 he was already employing an astounding one hundred people. In 1883 tragedy struck and the store burned to the ground. However, even after this reversal of fortune, Harrod remained committed to his customers and made all the Christmas deliveries he had on order that year. He also rebuilt the business, making a new building on the same site. Once the new store was complete, the network of customers he had started to expand rapidly and soon included many famous names such as Oscar Wilde and Charlie Chaplin. In 1898, Harrod introduced the very first escalator in a department store. In 1985, the Fayed brothers purchased the store, and then in 2010 rumors began to spread that the department store was up for sale once again. After denial from Al Fayed that Harrods was indeed for sale, it was purchased by Quatar Holdings in 2010. The deal was finalized on May 8th with a visit to London by the Prime Minister of Quatar. The sale price was 1.5 billion pounds, with half of the amount used up in paying bank debts. Al Fayed ensured his customers that the traditions of Harrods and the legacy would not be lost with the sale. Within the 330 different departments of the store there are many services and products. There are departments for clothing, jewelry, electronics, sports, pets, food, toys, furniture, home appliances and furnishings, and many more. You can also take advantage of a personal shopping service by appointment and take refreshments in an astounding 32 different restaurants within the store. You can also locate a pharmacy, barbers, watch repair, tailor, and a beauty salon within Harrods. Other services include food delivery, hampers for picnics, bespoke fragrances and cakes and event planning. It is estimated that up to an amazing 300,000 customers will visit the store on busy days. A large proportion of the customer are non English speaking. Within the store there are over 5,000 staff members from more than 50 countries around the globe.